Let me start off by saying I don’t know the technical nature of thit nuong. What I do know is that it’s everything delicious and you can use it a bunch of different ways. I also know that when you go to your favorite spot for a banh mi or a vermicelli bowl (bún), it’s got this stuff in it. What may be debatable as equally important as the thit nuong itself are the little extras that go with the bun or banh mi. Let me elaborate on a vermicelli bowl and don’t forget to get click-happy on the links along the way. Once you have your pork, you need to figure out what you’re going to do with it and I suggest a banh mi or the bún. Let’s start with the bún. You’re going to need vermicelli (rice) noodles of course. You can get this at your local Asian market. You will also need some pickled carrots and/or daikon radish. Three of my absolute favorite and key ingredients (as well as a minimum requirement to maximum satisfaction) are green onion oil, fried crispy shallots, and finely diced jalapeno and garlic. Lastly, you will need some fresh lettuce greens to mix in. I would avoid iceberg and romaine and go with something like a butter lettuce or simply leaf lettuce, or red leaf lettuce. You will also need to make the famous dipping sauce, nuoc cham. By now, you’re probably running to the nearest Vietnamese restaurant to buy your own vermicelli bowl. If you make a big batch of the above, you can keep eating it for days or make something like a banh mi. Plus, it really does taste better at home. There’s soul in it. That’s why restaurants all taste different, they all have different souls and variations. You may also look at adding peanuts, grilled shrimp, or egg rolls into this dish. Like I said, I’m not the expert, I just like delicious food. The pictures show you the basics of what I’ve described. 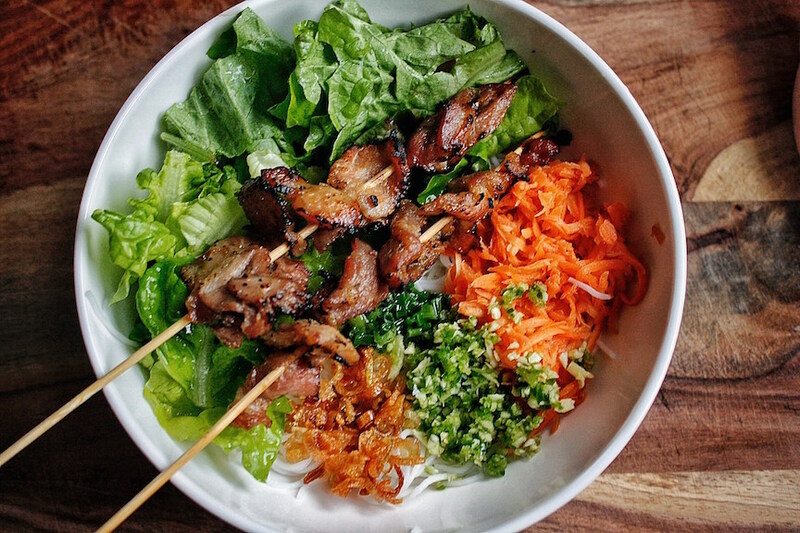 You put everything in a bowl starting with the vermicelli noodles, add your lettuce, scoop the quantities of the magical stuff in (I suggest more than less on this part) and top it off with your thit nuong. As I said before, delicious! Thanks again Frank! Be sure to check out another creation from him here, "Transforming a Charcuterie Board into Adult Grilled Cheese."